The health and well-being of your pet is our highest concern! TVRH is proud to offer the first true outpatient ultrasound service in the Durham/Chapel Hill area. This means that same day access to ultrasound diagnostics is available, in most cases. Your primary care veterinarian has recommended an outpatient ultrasound at TVRH, and we take the responsibility for providing for your pet’s healthcare seriously. The purpose of the Outpatient Ultrasound Service is to provide the highest quality ultrasound examinations to your pet in a timely, convenient, and cost-effective manner. We strive to provide seamless continuity of care between your primary care veterinarian and our board certified specialists to ensure the best possible outcome for your pet. Basically, the service is very similar to radiology services you may have encountered in human healthcare facilities. The ultrasound examination will be performed at TVRH and the results will be reported back to your doctor for interpretation. No consultation or reporting of results to the owner will occur during your visit to TVRH, but rest assured that communication between TVRH and your primary care veterinarian is a very high priority. Ultrasound is a painless method for imaging the body using very high pitched sound frequencies (higher than the human ear can hear). Ultrasound is commonly used in both veterinary and human medicine for a wide variety of problems, including diseases of the liver, kidneys, bladder, stomach, intestines, adrenal glands, pancreas, spleen, reproductive tract, blood vessels, heart (often referred to as “echocardiography”), thorax, eye, and muscles/tendons. Ultrasound is less useful for imaging structures like bone or air-filled structures like the lung. During an abdominal ultrasound, the patient is usually placed on their side. Although some pets are initially slightly anxious, almost all pets relax and remain calm once they realize that nothing painful is happening. The hair on the underside of the belly will be shaved and a gel will be applied to the skin. The images are obtained by placing the transducer (a smooth, handheld object, similar in size and shape to a small TV remote control) on the patient's skin and slowly moving the transducer around on the skin. Many patients go to sleep during the procedure! Most exams take between 30-60 minutes. Due to the nature of TVRH with emergency and critical patients, sometimes a more critical case may take priority and your pet's exam may need to be postponed. This is similar to the triage that occurs in human hospitals. In actual fact, this is a rare event, and usually only results in a 15-30 minute delay. After the ultrasound is completed, the Radiologist will attempt to contact your veterinarian by phone to discuss the case. A written report will also be faxed/emailed to your veterinarian within 24 hours. A CD containing the images will be sent home with you to give to your veterinarian. 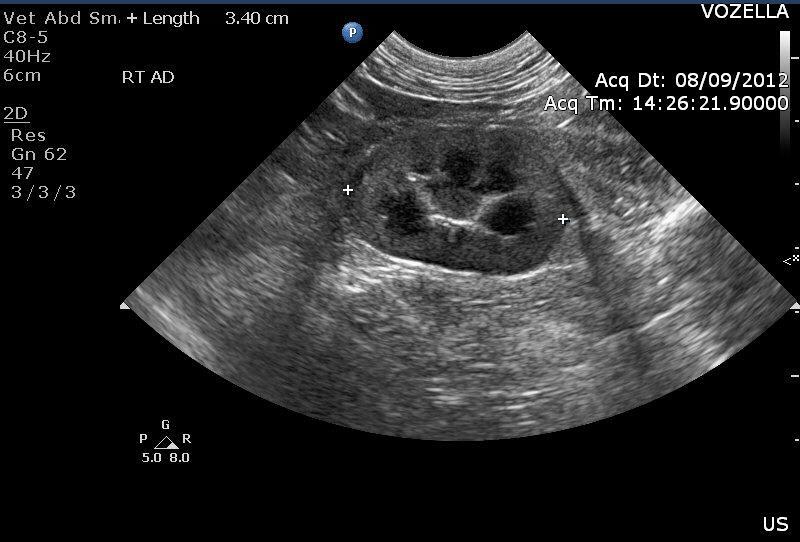 We will be happy to schedule a consultation with one of our veterinarians to discuss the ultrasound findings at your request. Often your veterinarian will request such a consultation after discussing the results with our Radiologist. Since accurate interpretation requires time, expertise, and thought, as well as a physical examination of your pet, additional fees will be assessed. We will be happy to discuss this with you at any time. Please do not feed your pet for 8-12 hours prior to the examination. Water is permitted. It is very important that your pet have an empty stomach in order to allow proper imaging of the area near the stomach. There are some diseases/situations where food should NOT be withheld; contact your veterinarian to determine if your pet is healthy enough for fasting. Please do not let your pet urinate for the 3 hours prior to your appointment. A full urinary bladder is essential. Please bring any materials (history, bloodwork, radiographs, etc) that your veterinarian gives to you. These materials help us provide the most accurate assessment of your pet. Are there any situations where I should NOT use this Service? The Outpatient Ultrasound Service is reserved for those pets whose condition is such that they can return home or to the primary veterinarian for further care. Animals that are very ill or whose condition is deteriorating can be cared for through the other services (Emergency, Internal Medicine, Surgery, etc.). Similarly, pets who have a fractious or aggressive nature may need to be sedated prior to the exam, and a consultation with the appropriate veterinarian should be scheduled to discuss sedation related issues. The bottom line is that we want to provide the best possible care for your pet, and we will work with you and your primary veterinarian to provide that care. Please contact us and we can discuss these options at your convenience. Who will perform the ultrasound examination? Dr. Lisa Woolman is the Radiologist who will perform the ultrasound examination. She is Board Certified by the American College of Veterinary Radiologists.